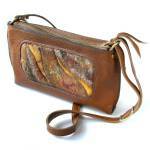 Medium brown leather zip-closure purse with handmade felt insert. Leather lining, interior snap-closure pocket. Solid brass hardware. The main compartment is about 8" wide, 5 1/2" tall, and 1" deep. It is a bit smaller than the flap-closure purses listed, but it is large enough to hold a checkbook wallet, Kindle Fire, an average size e-reader, or most smart phones.